-Cafes, restaurants and shopping all within a short stroll away. Enjoy new experiences of adventure and relaxation. Eat shop and play - all in one beautiful location. When there is even a hint of wind, sails of both kite and wind surfers line the waters edge of the pristine 3km long beach. Summer brings families to enjoy boogie boarding, beach volley ball, cycle the 7km long Te Ara Ta Huna, kayak the estuary or try out sup boarding, or walk through the Eaves Bush Scenic Reserve, meander through the Estuary Arts Centre, enjoy some boutique shopping or enjoy the new competition standard skate park, All in one beautiful location. Only 250m away from the beach. Location in Orewa CBD with shops and services only steps away. Private location with own entrance . The cabins are new with modern décor designed for affordable short term stay. 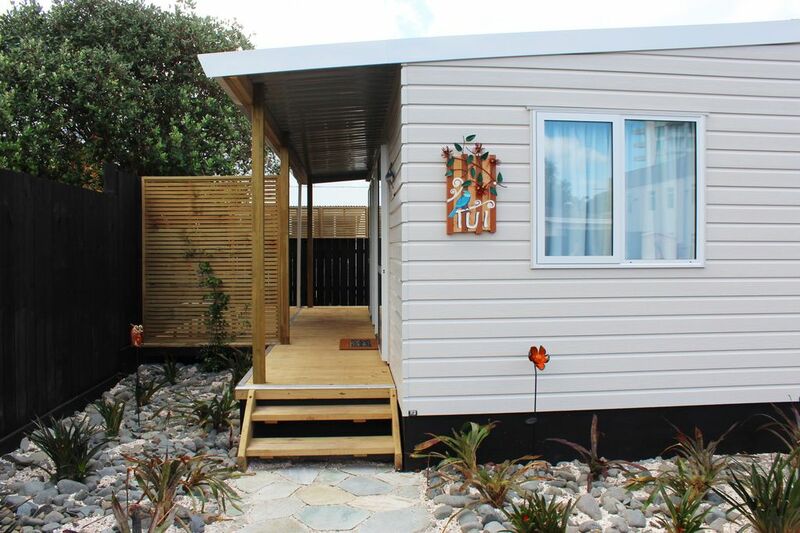 I booked this cabin for my sister from Australia and an old school friend to have a reunion in Orewa over Anniversary weekend. They were absolutely delighted with the accommodation; small but very well appointed and everything they required at their finger tips. They enjoyed the central location and were able to walk everywhere they wanted to go...the "old girls" are thinking of making this an annual event now. My wife and I stayed here over the weekend of 16 - 18 November, and we were amazed at this little gem that we had found. We felt very welcomed and felt like a home away from home. Really recommend staying here. Superbly located near shops and services in gorgeous Orewa. So near the beach with restaurants and an ambience of a holiday environment.